People often love and appreciate trees in their yard the way they love their pets. If and when something goes wrong, like a storm comes through and tries to knock a beloved tree down, the property owner feels bad. After all, we get used to the trees in our yard and ideally we don’t want to see them injured. We certainly don’t want to see them die. After a storm, what should you do to determine if a tree (or trees) on your property can be saved? First, look around to assess the damaged tree. Do not touch any downed wires on or near the tree(s). If there’s a large branch that has cracked and looks like it could fall at any minute, that’s when you need to call a professional from Ivan’s Tree Service to come over and deal with it. After you’ve dealt with downed wires and large cracked branches, you’ll have to ask some questions to determine if it’s healthy enough to recover just fine, or if it needs to come down. For instance, did the storm take away a majority of the tree’s branches? If so, it might not be easy to save. Trees that lose more than half their branches probably won’t be able to make enough food to last another season. Also, look for “the leader,” which is the main upward-facing branch of the tree. Has it been lost? If so, the tree might still survive, but it’ll look awkward. Therefore, it might be a candidate for coming down. Finally, ask yourself, “How big are the tree wounds?” Larger wounds don’t heal as easily (or as fast) as smaller wounds. When you have big wounds in a tree, they’re likely to fall prey to disease. Storms may try to damage trees. If you can safely prune broken branches and the tree doesn’t pose a threat to people or property, give it some time to heal and recover. However, if the trunk is split, more than half the branches are missing, and/or you feel like parts of it could fall on your car, house or people at any time, it might be best to have Ivan’s Tree Service come and chop it down. 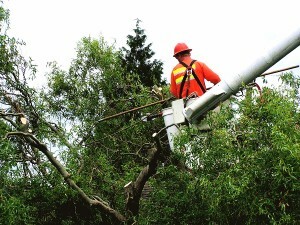 If you have a tree that is in need of trimming or removal in the St. Paul, Minneapolis area, contact Ivan’s Tree Service.